Every year, we dedicate one of our April blogs to help do our part for Oral Cancer Awareness Month. Oral cancer may not be talked about as much as other forms of the disease, but it’s still a very serious form of cancer that affects thousands of Americans every year. This April, our dental office in Madison wants to raise awareness by educating our community on the risks and signs of oral cancer, as well as what you can do to reduce your risk of getting it. If you notice any of these symptoms, see your dentist in Madison as soon as possible. 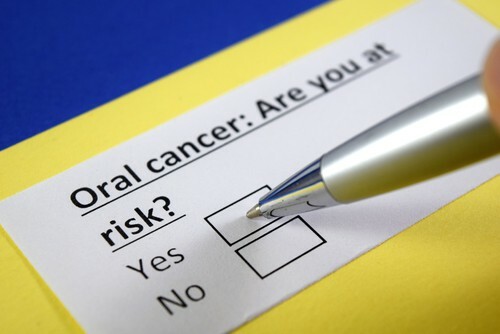 The best way to protect yourself against oral cancer is to avoid the lifestyle habits that put you at increased risk. Additionally, it’s important to maintain regular dental cleanings and checkups to help catch any problems as early as possible while the chance for successful treatment is greatest. If you haven’t seen a dentist in six months or more, we encourage you to call our Madison dental office to schedule an appointment today. It could save your life.